The historic site of the Battle of Princeton, a major turning point in the Revolutionary War and, thus, our country's independence, has another form of combat brewing -- this time in real estate. 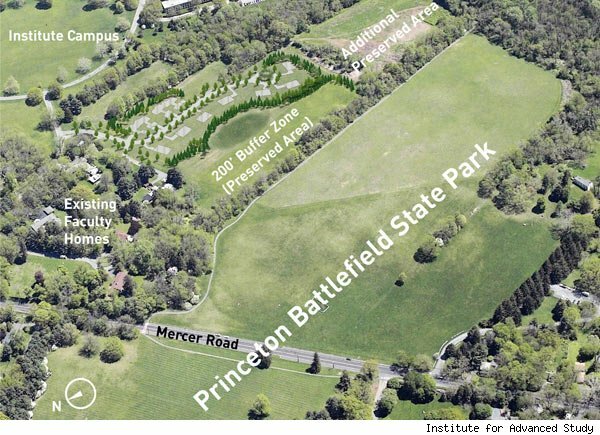 The Institute for Advanced Study, a genius incubator of sorts where the likes of Albert Einstein studied, owns 22 acres adjacent to the Princeton Battlefield State Park and wants to build 15 faculty houses on 7 acres of the parcel. 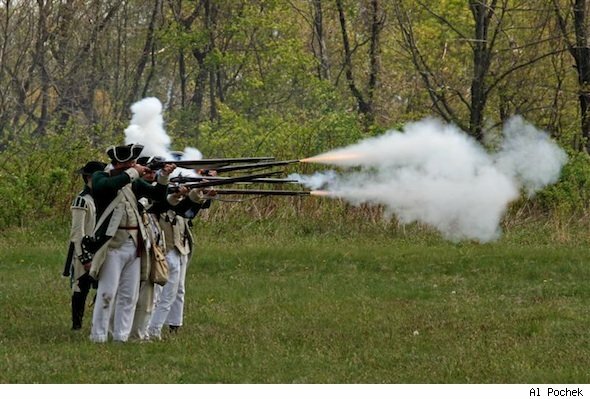 But the Princeton Battlefield Society isn't happy about the development, which it thinks would sully the sanctity of a place where George Washington fought the British at the 1777 Battle of Princeton. To up the ante, as a result of the plan the National Trust for Historic Preservation has put the disputed battlefield on its list of the country's 11 most endangered historic places. The Institute for Advanced Study has an 800-acre campus adjacent to the Princeton Battlefield State Park and wants to use the disputed parcel of land to maintain a tradition that the academic institution has had since its 1930 founding: to have its scholars living close by. "The institute is created as a residential community of scholars," said Christine Ferrara, senior public affairs officer. "We're unique that we give scholars [a chance] to come to the institute and just think -- no pressure from the outside world to teach classes and grade papers. We think those interactions produce some of the greatest advances in the sciences and the humanities." That institutional identity, Ferrara said, depends on close housing within a walking distance of the campus. But the high price of houses on the streets surrounding the institute's campus is preventing the purchase of homes for scholars and their families. It's "prized real estate," Ferrara explained, near downtown Princeton and in an idyllic leafy enclave. But aren't there any other options? "There's no other place where we could put this housing," Ferrara said. "It's not an option for us to build anywhere but here." And the institute believes it has every right to do so. "We're building on our private land adjacent to our campus," Ferrara said. "We don't see there being a conflict. We've had plans to build on the site for many years. We have taken very careful steps to develop this plan and have unanimous approval from the Princeton Planning Board, so that's what we're doing." The institute also sprinkled salt on the Princeton Battlefield Society's wounds, claiming there is already a large enough area for historic preservation -- one that's not living up to its potential, given its space. "There's quite a large park that goes toward commemorating the battle," Ferrara said. "There's a lot more that could be done for school children, for the community. Part of what we do is help to enhance the commemorative, interpretive materials in the park." There is, indeed, an abundance of verdant fields, but there's one snag in the institute's reasoning: the exact spot where it wants to build the homes was the most significant theater of war for the Battle of Princeton. Bruce Afran, lawyer for the Princeton Battlefield Society, emphasizes the historic significance of the land. "There is no doubt as to the centrality of this piece of land to the Battle of Princeton," Afran said. "The right flank of Washington's counterattack took place on this piece of land. A battle has two flanks, so half of this battle took place on this parcel." The remnants of the battle are still there: artillery shells that were fired into the banks and grapeshot cannisters stuck into the muddy declivity. When the institute first began its plan, the archaeology hadn't been done to reveal this evidence. 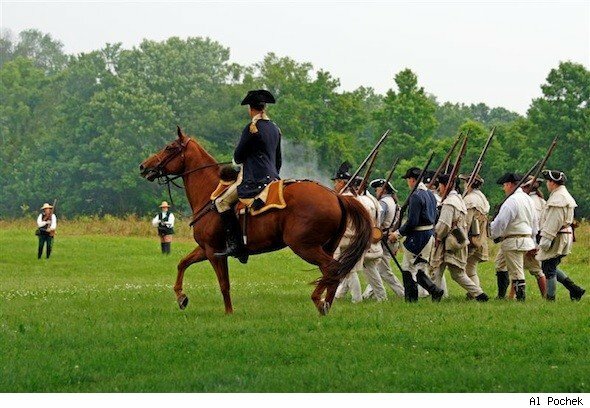 In addition, the first marine killed in battle lost his life at the Battle of Princeton, according to Jerry Hurwitz, the president of the Princeton Battlefield Society. It also marked Washington's first victory over a British regiment -- he had only previously beaten Hessian soldiers. "It destroyed the mythology that the British were invincible" Hurwitz said. "He made them panic. He changed the whole mentality. Suddenly he's a threat. He put them on a defensive posture. Now they weren't so sure. It changed the psychology of the war." "This is probably the most important remaining battlefield parcel in the United States," Afran said. "It's inconceivable to me that an academic institution is trying to close its eyes to history." "Would you build faculty housing at Gettysburg?" Hurwitz added. Instead, Afran suggests, the Institute should take a portion of its $700 million endowment and buy houses in the surrounding neighborhood. He says the new building project will cost at least $9 million. For $10 to $12 million, the institute could purchase existing homes. "They're just as close to the institute," Afran said. "They'd rather build slightly cheaper houses, but you've got to balance." Afran was also quick to point out that Einstein didn't live on campus but, instead, walked or biked from Mercer Street toward downtown Princeton. Even if buying ends up a more expensive endeavor, Afran argues, it's better than the deconsecration of land that has remained "virgin territory" since the period in 500 A.D. when it was an Indian settlement. "It's a place where American and British soldiers died where they want to put toilets," Afran said. "I don't know why they want to do this. I can only say they want to do this. Sometimes an institution fails to see the forest through the trees. We're here to say, 'No, you have to look further.'" Beyond the significance of the plot of land, there are legal arguments that could put holes in the institute's case. For one, the portion of the Battlefield the institute plans to build on is a wetland area. 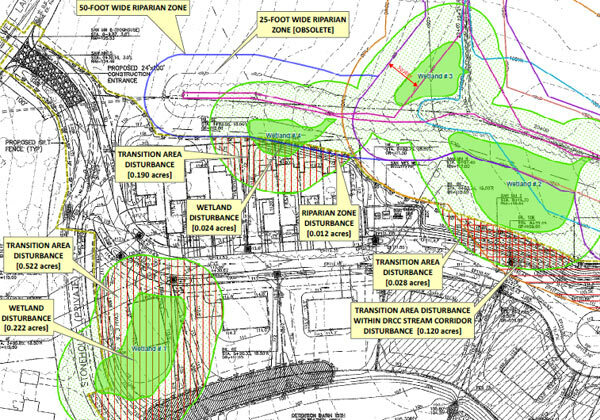 In 1990, the institute actually hired Amy S. Green Environmental Consultants to conduct a survey of the land, and she highlighted wetlands right smack in the middle of the now-disputed parcel. The soil borings revealed visible hydrology: wetlands, no doubt. Stony Brook, a local tributary, sluices through the area along the Delaware Raritan Canal. But in 1999, the Institute wanted a second opinion and hired Van Note-Harvey Associates: the new survey mysteriously made no reference to wetlands. Was it divine evaporation? "They just don't disappear," Afran said. "The institute concealed the existence of wetlands where it wants to build. There's an element of fraud to the whole application." Coincidentally, Afran and the Princeton Battlefield Society hired Amy S. Greene Environmental Consultants in September 2011 and she identified wetlands once again. The institute begs to differ. "We're not building on wetlands," Ferrara said. "All of those things were looked at by the Planning Board of Princeton. Those are just allegations and nothing but." But if the land is soggy enough, the fill that the institute will have to use to even out the 10-foot plateau would not only destroy the historical area, it could violate the Federal Clean Water Act. "It's an act of scientific savagery," Afran said. There's also a significant contractual issue. In 1990, the institute sued Princeton Township for the right to build more than 200 single-family homes on a piece of its land it owned one mile away from the currently disputed site. The township resisted, but after two years of litigation, the institute prevailed. As a part of that 1992 settlement, the institute agreed that all single-family homes would be confined to Development Area A -- a 600-acre plot called the Institute Woods, which is a contemplative swath of boscage where scholars saunter with sweaters draped over their shoulders. But there was community pushback against building there. So, instead, in 1997, the Institute pocketed $14 million after selling the development rights to the territory to Princeton Township. According to Afran, the institute's new attempt to build clustered housing (housing where more than one home sits on a single acre of land) on the battlefield is in violation of zoning limits from the 1992 contract, which restricted all clustered housing to Development Area A. Even though the institute ultimately decided not to build on Development Area A, the contract it signed is still valid, he said. The battlefield parcel isn't big enough to put each home on its own acre of land, so the institute, Afran said, is trying to sneak in an illegal cluster zone. Legal arguments and historical significance aside, saving the battlefield is not a certainty: 10 of the 242 endangered sites listed by the National Trust for Historic Preservation over the last quarter century have fallen prey to building projects. Afran is taking aim to file an appeal to the Princeton Planning Board that could take two years to resolve. 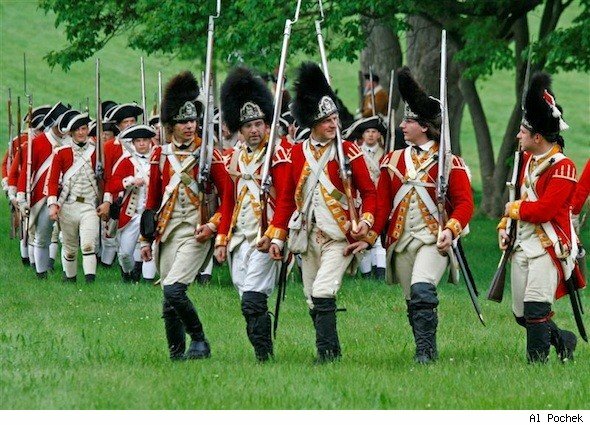 Meanwhile, the Princeton Battlefield Society is hoping that it can convince the deep-pocketed institute to alter its plans for the sake of foundational terrain in our nation's history. CORRECTION: An earlier version of this story indicated that the disputed 22-acre parcel is within the Princeton Battlefield State Park; it is on adjacent land.